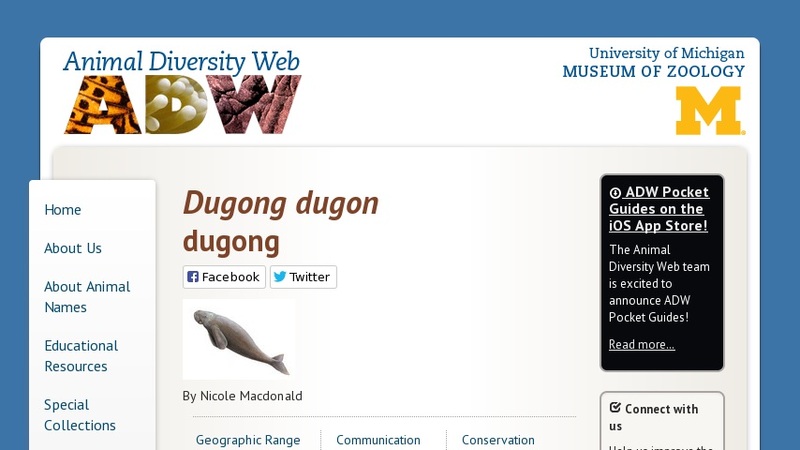 Species profile of the dugong, Dugong dugon, including taxonomic classification, geographic range, biogeographic region, habitat, physical description, diet, behavior, reproduction, economic importance to humans and conservation status. Selected references and glossary are provided. Classification feature provides links to descriptions of each taxon, e.g. Animalia, Mammalia, Sirenia, etc., including images and details on anatomical features used in differentiating at each level. Appropriate for grades 7 and up.